Sudan Political Scene: What's the Good, the Bad and the Ugly? What Has Gone Bad in the Sudan Political Scene? The Sudan political scene... well the Sudan's Political Scene is really developing badly, as never before under the worst regime in the world based on terrorism. * Search engines' TECHNICAL matters require to write it without the apostrophes. Apologies. hoa-politicalscene.com/sudan-political-scene.html - Sudan Political Scene: December is an occasion for the Sudanese revolution 1. The continuing tragicomedy in this political scene in Sudan is not a wonder at all. It is the outcome of misruling practiced by religious & sectarian political parties & enforced to rule the political scene in Sudan by military dictators since the independence of Sudan from Britain in 1956. In fact Britain plays a role in the deterioration of the political scene in Sudan, as the Britons have given the independence to two of the leaders of the sectarian powers in the country and thus the independent country has formed into this sectarianism, which was broken by three military coups. The military coups have also changed to be religious and turned in the last coup to religious terrorism. In the first military coup this was just a practice to wash the face of politics with religious notions and Arabisation. 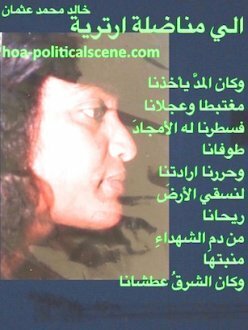 Just a note before you continue reading the political scene in Sudan: The first time I wrote Sudan's Political Scene, some 14 years ago, I published it in a hurry. Just to admit. Therefore, it was fearfully bad. Now here is a revised version of Sudan's Political Scene. Sudan's Political Scene. I revised it two times. The first time was without images, a couple of years ago. Then I revised it the third time a month ago and added the images. This is to know the main content of this page is very old. However, I published lately another page about the Sudanese Political Scene. Please read it and, well comment on it, or write about this political scene. You can upload up to 4 pictures too with your commentary, adding some descriptions to that political scene in pictures. hoa-politicalscene.com/sudan-political-scene.html - Sudan Political Scene: December is an occasion for the Sudanese revolution 2. The following lines about the political scene in Sudan uncover the political development in the country since the forties until this moment. They scatter on some pages. Those lines reflect the root causes of the political problems in Sudan, and perhaps they may give you the answer to understand the political situations now and the impacts of sectarianism in a traditionally considered Muslim environment. However, this consideration comes only from the Islamic prospective, or the Islamic atmosphere in the north, east and west of the country. It is from this prospective that the wrong concept of what they call Arabic Sudan rose to give the favour to the North, although many people in the north are not pure Arabs. We call this the identity problem of Sudanese, which produces most of its problems. Well, the core of its economical, political and social problems. hoa-politicalscene.com/sudan-political-scene.html - Sudan Political Scene: December is an occasion for the Sudanese revolution 3. 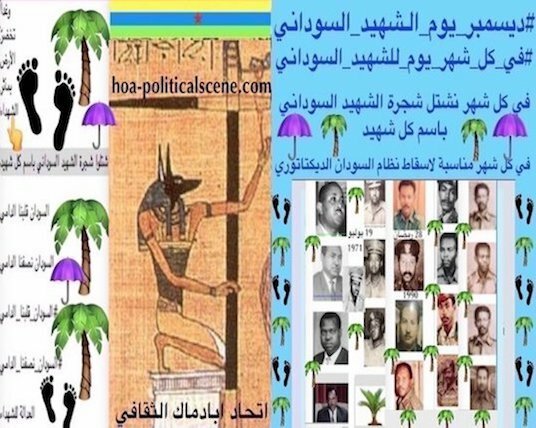 The sectarian powers who led the Sudanese sectarian parties invest in this political scene badly to gain exposure, since the forties and they have developed the prospective of an Islamic atmosphere, to help them grow their wings. On this policy, they depend primarily on traditionally and almost politically illiterate Muslim people in the North. Thus, they dominated the political scene in Sudan through the past until the coup in 1989. This was the easiest job for the traditional sectarianism to invest in the business of politics to continue dominating that peaceful society and hence present themselves as spiritual leaders of that society. They knew pacifism, simplicity and the atmosphere of political illiteracy would help them sediment their beliefs deep in this society in the North, which then was the heart of the political power. hoa-politicalscene.com/sudan-political-scene.html - Sudan Political Scene: December is an occasion for the Sudanese revolution 4. 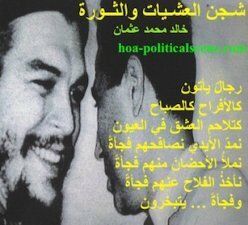 It was also at that time, another political power began, influenced by the Muslim Brotherhood in Egypt to invest in the propaganda of Islam in a different way and to be the possible alternative to sectarianism. They knew the spiritual nature of the people in the north, east and west of Sudan, and most importantly, they knew how to exploit it. They succeeded (أولاد الأبالسة), the Muslim Brothers in Sudan. The presence of this political power, that claims to be the only group that cares about Islam, was planned after the independence of Sudan and through the political decades to marginalize the sectarian power and build membership from the bases of that power. hoa-politicalscene.com/sudan-political-scene.html - Sudan Political Scene: December is an occasion for the Sudanese revolution 5. However, there was a hope in that time when the Sudanese Communist Party (SCP) emerged to lead and energize the movement towards the independence from Britain. It was normal that time to see some communist youths from traditionally Muslim houses leading the demonstrations of the independence of Sudan. My late uncle, who was my mother's eldest brother led many of the independence demonstrations, while he was a boy messenger in the head of the police department in Khartoum. He was called Al Sir Abdurrahman Mohammed Osman Sid Ahmed. hoa-politicalscene.com/sudan-political-scene.html - Sudan Political Scene: December is an occasion for the Sudanese revolution 6. 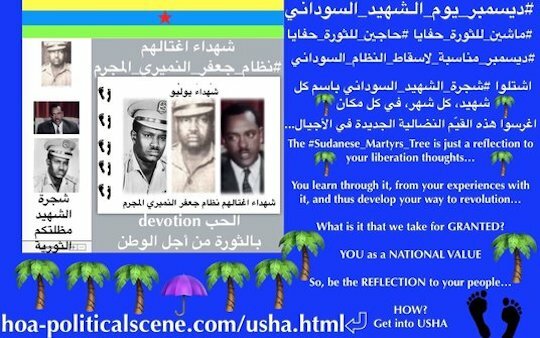 All of these powers except the last one (the Communist Party of Sudan) invested in the business of politics, to get their followers pay rations and charities through donation boxes on their tombs, or work for them on lands and build wealth for them for the sake of having some blesses from the spiritual leaders. The Sudanese people who do this and until now in the twenty-first century believe that their blessing get them to paradise directly. HAHAHA, my goodness! They constructed the two traditional parties to grow this business and prepare to claim the political power after independence. In that political scene in Sudan, it was common to see people make great efforts to serve the sectarian powers and feel that they obliged to do so. Therefore, the leaders of the sectarian powers appeared as the only power that was available in the Sudan political scene to work with the British to achieve peaceful shift to gain the independence of Sudan in favour of their own interests. 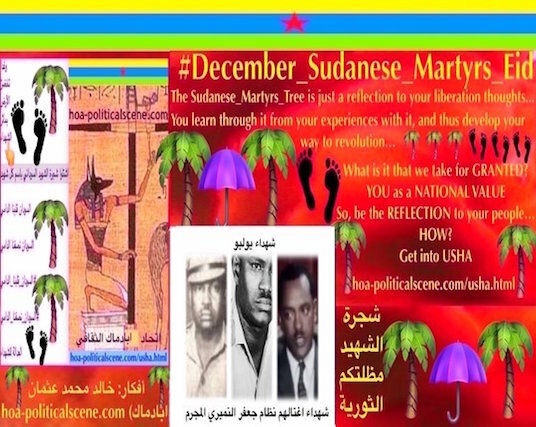 hoa-politicalscene.com/sudan-political-scene.html - Sudan Political Scene: December is an occasion for the Sudanese revolution 7. Meanwhile, the SCP continued to struggle towards getting out of the situation on which the party found itself, as minority in the light of the fact that it is hard for it to work in an obsessed society by false Islamic propagandas. In addition, the religious parties have always been in confrontation with the Communist Party of Sudan, they conspired against it and even threw it out of parliament once. 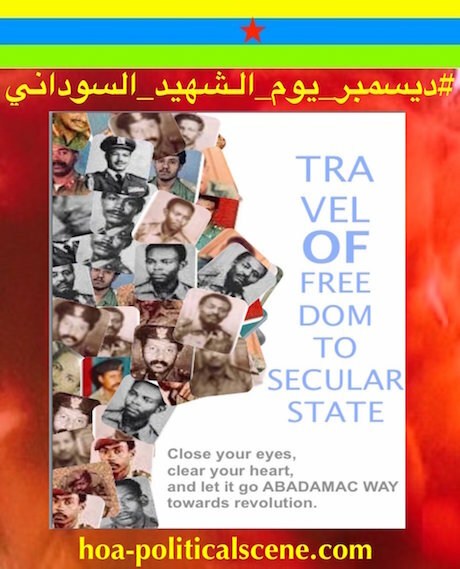 The sectarian parties and the Muslim Brothers worked together investing on the illiterate political scene in Sudan to achieve inuring the Sudanese Communist Party by describing the party as infidel and atheist party and imposing the bad picture, the Sudanese dislike. They destroyed the economy of Sudan completely, as they destroyed many beautiful and productive regions in the country, such as Kordofan (Kordufan / Cordovan) completely, but not only South Kordofan Sudan. hoa-politicalscene.com/sudan-political-scene.html - Sudan Political Scene: December is an occasion for the Sudanese revolution 8. 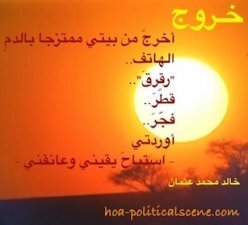 The Sudan Political Scene in Arabic! يهيمن علي المشهد السياسي السوداني (Sudan's Political Scene) وباستمرار فكر شوفيني، يمثله حزب الأخوان المسلمين في السودان، الذي كان يُسمي بهذا الاسم عندما ظهر متأثراً بحزب الأخوان المسلمين في مصر، ثم غيّر الاسم الي جبهة الميثاق الاسلامي، وغيّره مرّة اخري الي الجبهة القومية الاسلامية (NIF)، ثم غيّره أيضاً بعد ذلك الي اسمين، هما حزب المؤتمر الوطني وهو في السلطة، وحزب المؤتمر الشعبي وهو في المعارضة، بعد انقلابه في عام 1989م علي السلطة الديسوقراطية لحكومة الصادق المهدي الكسيحة. وتهيمن أيضاً علي هذا المشهد السياسي السوداني احزاب طائفية سودانية (Sudanese Sectarian Parties)، ظلت تعمل منذ استقلال السودان في عام 1956م علي تهميش القوي الثورية التقدمية، التي يمثلها الحزب الشيوعي السوداني العظيم، وتطلق الشائعات في مجتمع مسلم تقليدياً علي انه حزب ملحد. 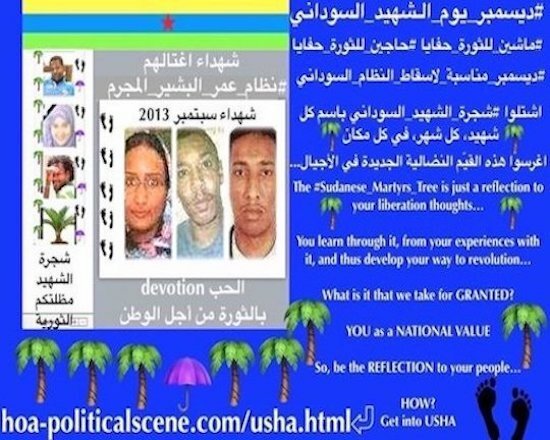 هذه الأحزاب السياسية السودانية (Sudanese Political Parties) الطائفية هي في الواقع احزاب يمينية، رأسمالية، لا تقلّ في شوفينيتها عن حزب الأخوان المسلمين، تستمع بالثروة وقد ظلت تهيمن علي السلطة والثروة منذ استقلال السودان، وتستحوذ عليها دون وجه حق، حتي بنت لها اقطاعيات، ورأسمالية تتملك العديد من الاراضي والعقارات... وبطبيعة الحال من شقاء وعرق الشعب السوداني، والذي ظلّ يخدمها باستمرار ويفوِّزها في الانتخابات، ليعكس درجة "الاستحمار" التي نالها من هذه الأحزاب، والتي أسميتها بالأحزاب الرمادية. هذا الواقع السئ في المشهد السياسي السوداني، ظلّ يسود السودان، ومنذ الاستقلال، ومهد بدوره لحزب الأخوان المسلمين من السيطرة علي الأوضاع، والاستيلاء علي السلطة بكل بساطة، وحيث وجد الساحة مهيأة، والمجال مفتوحاً لسيطرته طيلة هذه السنوات العجاف، والتي انجب فيها السودانيون أجيالاً تربّت تحت هذا النظام، وبالتالي أحدث ذلك علي المستوي الديموغرافي تحوّلا فظيعاً لصالح هذا النظام الاسلامبوتيكي. 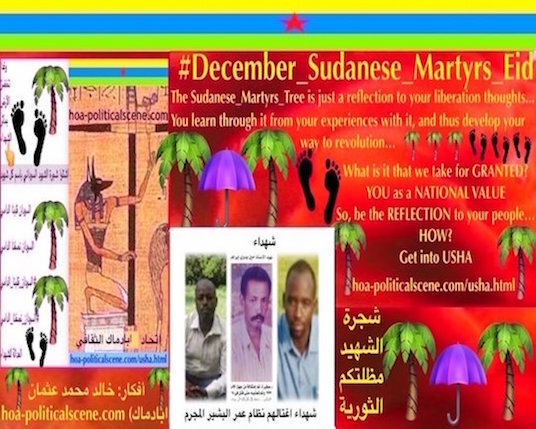 hoa-politicalscene.com/sudan-political-scene.html - Sudan Political Scene: December is an occasion for the Sudanese revolution 9. كل ذلك يمكن ان يزيل أيَّ دهشةٍ، بخصوصِ ما ظلّ يحدث في السودان، منذ عقود عجاف من الذلّ الاجتماعي، والاقتصادي، والصحي، والتعليمي، والنفسي، يندرج تحت ذلك تغييب العقلية السودانية، الذي لازم الشعب السوداني منذ الاستقلال، وجاء هؤلاء الكيزان الأخوان المسميين بالاسلاميين ليجدوا الشعب جاهزاً لهيمنتهم، التي طالت بدورها عقودا عجافا. الا انه ولابد، فان المثقفين الثوريين لم ينطلِ عليهم هذا التغيبب المثير للذهنية السودانية، والذي ظللت أكتب عنه منذ عقود، حتي قبل مجئ هؤلاء الأبالسة الاسلاميين، وأصبح البعض الآن يتحدث عنه باسم "التهميش". ان المشهد السياسي السوداني (Sudanese Political Scene) قد اُبتلي ومنذ الاستقلال بشخصيات قيادية، لا همّ لها سوي مصالحها ومصالح احزابها الدينية والطائفية، وبالتالي فان قضايا السودان الوطن الواحد الموحد، الذي يمتد الي اكثر من مليون ميل مربع وواحد، لم تكن يوماً ذات أهمية قصوي، وذلك ما تسبب في التهميش الاقليمي، وأنتج بالتالي فئات كبيرة مهمشة وقضايا اقاليم مهمشة، يصعب حلها، علي هذه الأحزاب، التي صنعتها أساساً. hoa-politicalscene.com/sudan-political-scene.html - Sudan Political Scene: December is an occasion for the Sudanese revolution 10. 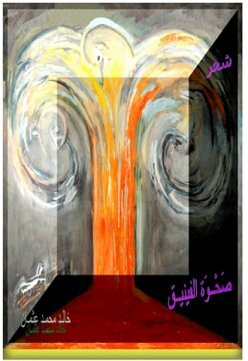 لقد ارتكبت الجبهة القومية الاسلامية جرائم سياسية لا حصر لها (NIF's Political Crimes)، في هذا المشهد السياسي السوداني، وحتي من قبل استيلائهم علي السلطة، بقيادة طريد العدالة الدولية، التي تمثِّلها محكمة العدل الدولية (ICC)، المدعو عمر البشير (Omar al Bashir). وذلك أمر معروف حدث تحت ظل ما أسموه بقوانين الشريعة، أيام الدكتاتور الثاني في تاريخ السودان جعفر النميري (Jafar Al Numeri)، الذي جعلوه اماماً للمسلمين، ونفخوه مثل الديك الرومي، ليذهب في الناس تقتيلاً وقطع ايادِ وصلباً. 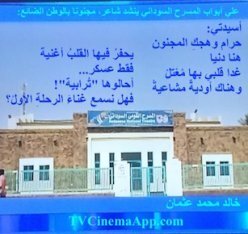 ثم بدأوا في اطار هذه الجرائم، عنفاً منظماً ضد الطلبة التقدميين، في الجامعات والمعاهد العليا. وهو نفس العنف الجبهوي الاسلامي، الذي تبناه النظام الشمولي الذي أتوا به، ليرتكب العديد من الجرائم (Sudanese Regime’s Political Crimes) والمجازر في حق الشعب السوداني في جميع أقاليم البلاد، وليس في دارفور (Darfur) وحدها. انه لمن الواضح جداً في المشهد السياسي السوداني عبر التاريخ ان جرائم هؤلاء الاخوان الأبالسة، سواء تلك الجرائم التي ارتكبوها في تنظيمهم، أيام ما سُمي بالديمقراطيات، والتي ارتكبوها بعد ان تولوا السلطة، أيام نميري، وأيام البشير، فيما يُعرف بجرائم الحُكام السودانيين الارهابيين السياسية (Sudanese Terrorist Rulers Political Crimes)، لا تساويها أي جرائم أخري اُرتكبت في حق الشعب السوداني، حتي من الانجليز، عندما كانوا يحتلون السودان. 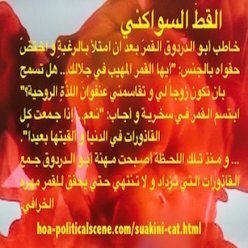 لهذا فان الدعوة الثورية الحقة تكون دائما بانه لابد من محاكمة هؤلاء المجرمين محاكمة قاسية، علي ما ارتكبوه عبر التاريخ في حق الشعب السوداني. 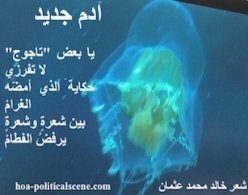 ويجب الا يسلم أحد منهم. مثل هذه الأوضاع المتدنية المتردية الباهظة التكاليف لا يمكن ابداً معالجتها بغير إحداث ثورة حقيقية يقودها نفر قلائل يتمتعون اولا بالإرادة ويرغبون في التضحية بأنفسهم من خلال عمليات فدائية جرئية، يتمّ توجيهها بصورة مخالفة لعمل التنظيمات المسلحة التي أثبتت فشلها تماماً في هزيمة هذا النظام الدموي. طالع صفحة "النُّمُور السودانية" التالية Annumor AlSudanyah. هذا الباراغراف جديد تمّت إضافته بعد سنوات عديدة من نشر هذه الصفحة لأول مرّة قبل عدّة سنوات والإضافة تمّت عندما عدت لتجديد الصفحة. لذا لزم التنويه، يا عزيزي. Many Arabic pages are at the Arabic HOA Political Scene. Continue the Sudan Political Scene here at Political Problems in Sudan, Democracy in Sudan, Sudanese Dictatorial Regimes, Sudanese Resistance Movements and Military Religious Regime. Readers of the HOA's Political Scene newsletter and visitors to the website have commented and written about the political scene in many countries in this area. They built more pages on this website. Thanks to them all. You can continue the political scene on those sitemaps too. 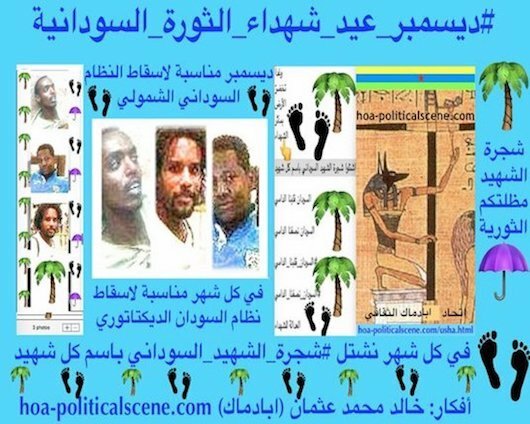 ** If you liked this page about the Sudan Political Scene, please share it with your services through the following buttons, the buttons at the left or at the bottom of the page. Thanks. 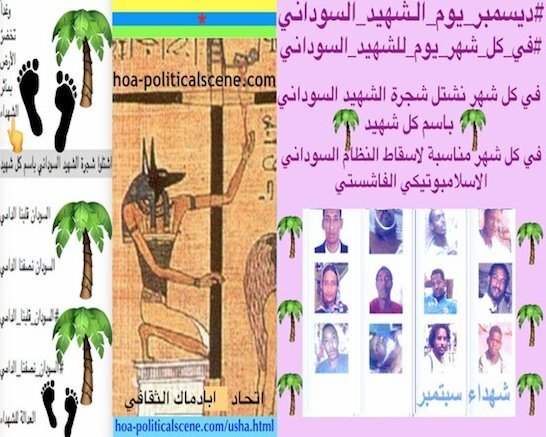 ** Forward Sudan Political Scene to all people you know and fill the link to this page in the box at Forward HOA's Political Scene. ** Contribute, comment and write articles about the Sudan Political Scene through the following form. Please enter your name, your email address and elect to receive notifications about replies to your input. I will never share your email address with a third party. The system will use it to send you those notifications. The Good, the Bad and the Ugly in Sudan! We Need National Consensus in Sudan! 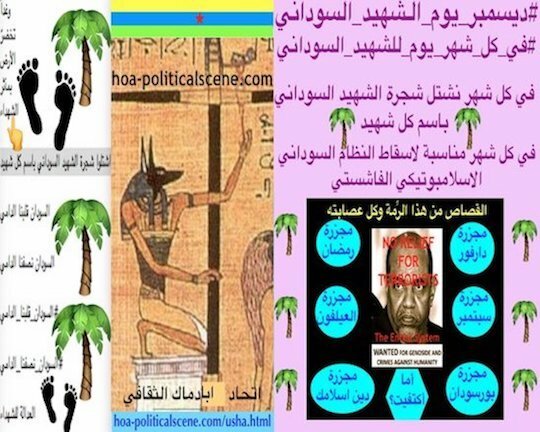 I used Solo Built It tools on the image at the bottom of the page to empower the Sudan Political Scene and the entire HOA Political Scene, along with the HOA Political Scene Blog, which is the automated news, of the Horn Africas Network. Well, those are great all in one place website building and optimizing tools that make this technology snap.